Getting into Hearts and Flowers for Valentine Blogging hasn't been as easy for me this year as last! I've been trying to figure out why! So far I've come up with ...... Nada, Nothin', Not A Thing as the Reason for not getting into the Season! It's not that I don't have LOVE in my life or a LOVE of My Life! I DO! except it was Translated to...Si, que hago. And....I DO have the most LOVEABLE GrandKids. Four of them. They are Sweethearts, and HiHoney and I LOVE them Dearly! We have been In LOVE with their Daddy...Our Son...for nearly Forty years. 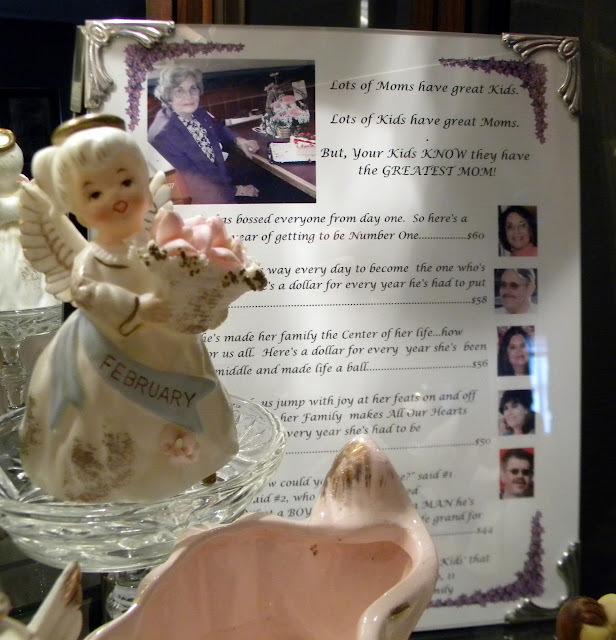 I always think of LOVE when I think of my Mom. She has a February Birthday and it's a perfect month for her because she is the HEART of our Family. Last year about this time I started The Crocheted Pineapple PinCushion Project. As with most of my projects, it grew from wanting to make One or Two to making one in every color of Crochet Thread out there. Which lead to a Ribbon Collection, a Crochet Hook Collection, another Basket Collection, and a Lace Collection...which thankfully, I already had. 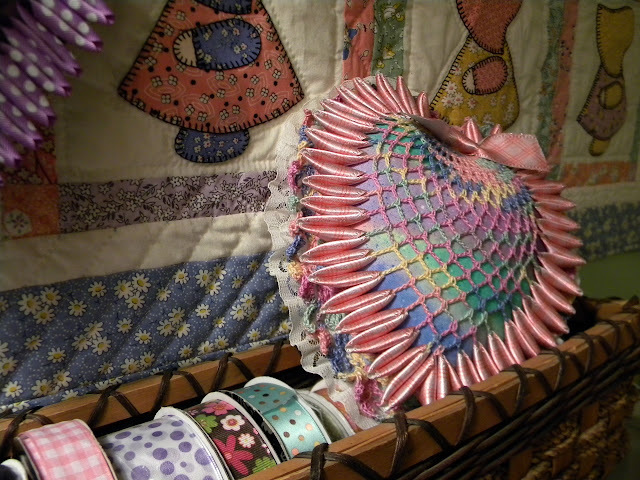 Oh, I almost forgot...a Vintage Crocheted Heart PinCushion Collection! You know, I'm 'Feelin' The LOVE! I'm really getting in the Hearts and Flowers mood! I'm ready to Finish the stack of crocheted HEARTS. I'm ready to Start my Bloggy LOVE FEST! As Aways...Thanks Beverly for making Saturday Pink! I'm ready for another HEART Shaped Box of Chocolates! Oh I love the crochet hearts! I have 3 of them that were my aunties...wish I could crochet and make them too. Yours are beautiful! 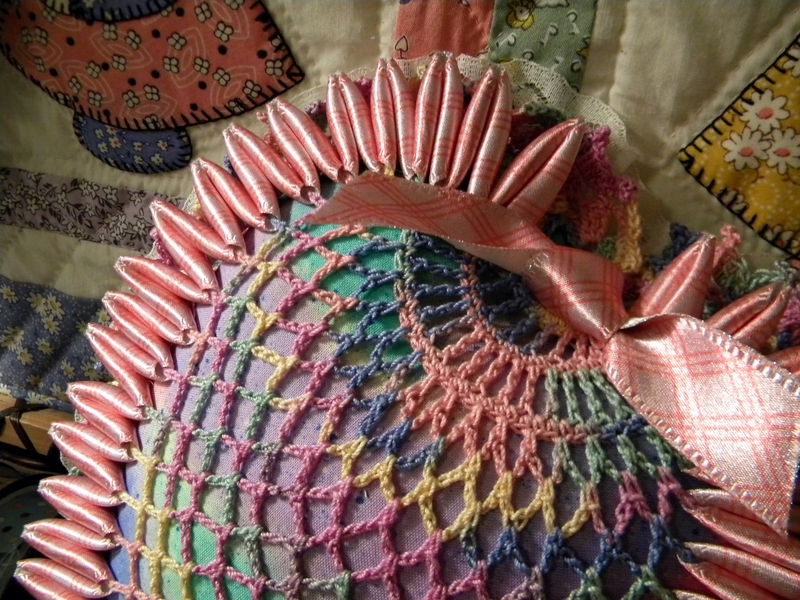 and the sunbonnet sue quilt .. oh my. Love your crocheted hearts. The quilt in the background isn't too bad either. 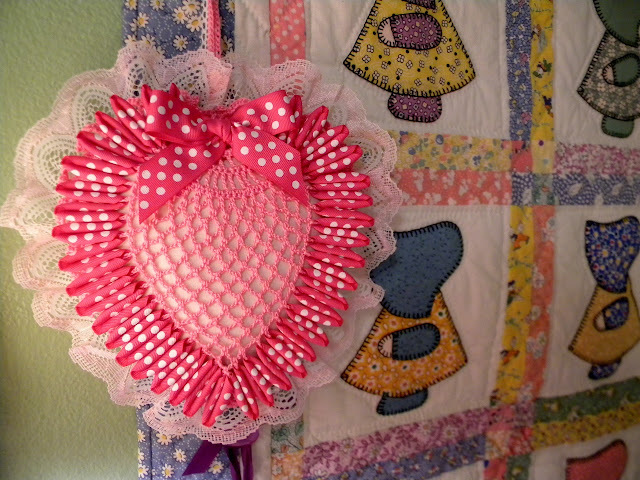 Sunbonnet Sue's are so cute and appropriate for a gal named "Sue". Good morning Sue, we are supposed to be in Florida celebrating our dear friends 50th but nope, Bill came down with the flu. Sigh. The bright side is I can visit my pinkies today. I'm lovin' it! You definitely made me smile with your heart post. See, posting just brings latent feelings in us. By the time you finished sharing your stunning heart pillows etc. you were in the mood. Your mom's photo is special, I miss my mom and dad soooo much. Finally, I am jonesing for a heart box of chocolates too. I better inform my sick hubs. Smile! No doubt about it - you found your Valentine Heart mojo - gorgeous hearts! Hi Sue! I'm so glad your blog caught my eye this morning and I read about "Pink Saturday"! I decided I should participate and it was FUN, thanks!!! The rainbow crochet heart is adorable! Your hearts are beautiful, Sue...they gave me a tug at mine; remembering my Texas grandmother and her hearts and pineapples and other things crocheted. I love your crocheted hearts. I try to buy them when I see them as they sell really well...I guess lots of folks love them. Glad you are feeling the Valentine Day spirit. I will find mine when it is above freezing (ha). Have a great week and stay WARM! Oh!!! I just love you hearts! So pretty and just love how very different each one looks! Love your crochet hearts and the February girl. My daughter has a February birthday! I love your pin cushions and your post about love! I have a very, very old heart-shaped pin cushion that was my dear mother-in-law's. The pineapple cushion heart is so special. Happy Pink Sat. 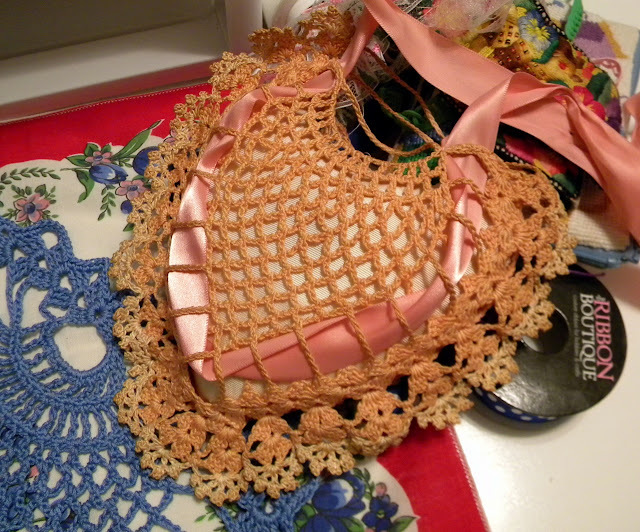 Sue, I so remember the popularity of these pineapple crocheted hearts back in the 40s & 50s. Yours are gorgeous. It's a pleasure to meet you and share Pink Saturday with new friends. Drop by and say hello and "follow me" on my pink journey. Your vintage crocheted hearts are so sweet! 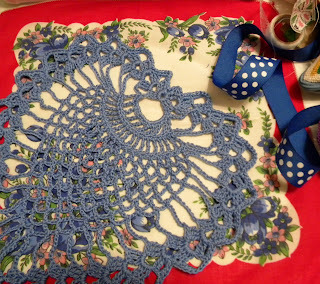 Fellow Texas Gal, you have some very pretty crocheted treasures! Happy Pink Saturday! Those pretty hearts are gettin me into a Valentine mood too. I love your heart pin cushions. A couple of years ago I saw some of them. And ever since I have wanted to make some. But can not figure out how. Esp. the ribbon on the sides. Just Beautiful. Happy Pink Saturday, dear Sue. Your crochet hearts are pulling at my heartstrings. Wow! They are just exquisite. Bath Baking Bread Pudding for Pink Saturday! For The Birds....My New Collection!